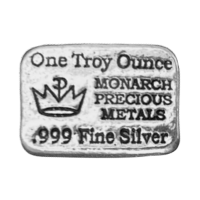 1盎司Monarch手浇银条 Monarch Precious Metals has been a leader in the hand poured segment of the silver market since 2008. All of their bars are hand poured and stamped the old fashioned way, with no two bars being alike. All bars have genuine character, with dips, ripples and uneven surfaces. Add something unusual to your stack, grab some of these today!